INNX cargo net including 1 stretch cargo net, 4 plastic hooks Universal fit for most of cargo area, with the size 27.5"X27.5" ,it can be stretched to 60" for special need. 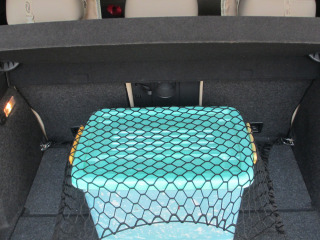 Perfect for rear cargo storage in cars, vans, trucks, SUVs and even some Mini Vans. 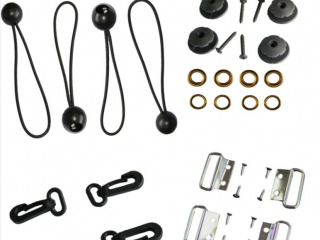 Easily Installation with net and hardware bracket Easy installation with 4 hooks to the corner of your cargo liner, or the tie down anchors that you cars have. Multifuction use of cargo net, it can be used as a fasten net or can be storage net when fold. 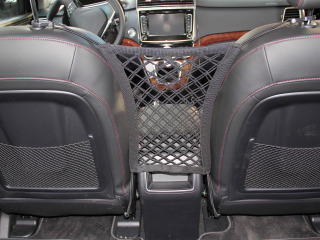 Prevents distracted driving and keeps pets from jumping into front seat / Bucket Seat on sudden stops.Universal fit for most vehicles sedan,Suv,Van, Stretchable to cover the full capacity of two driving seat You can put other stuff in the middle of it for storage use. Easy installation with 4 hooks on the head rest and bottom of seat Dimensions: 11"x12.6"